¶ 3 Leave a comment on paragraph 3 1 I guess you could say that From a Buick 6 is the closest thing to filler on Highway 61 Revisited. It doesn’t really break any new ground, the use of language is nothing we haven’t seen before, and it doesn’t have the most memorable melody or beat. However, I think that says more about the high quality of Highway 61 than it does about the quality of this song. ¶ 4 Leave a comment on paragraph 4 0 From a Buick 6 is clearly a blues song at heart. It follows the typical blues chord structure, it repeats lines, and it deals with the same woman-trouble themes as do so many blues songs. Many have noted its similarities to Sleepy John Estes’ Milk Cow Blues. ¶ 6 Leave a comment on paragraph 6 1 From a Buick 6 is another of many Dylan songs from this time period in which the title doesn’t appear in the lyrics. At first blush, the title doesn’t appear to have anything to do with the song at all. ¶ 7 Leave a comment on paragraph 7 0 Dylan frequently gave nonsensical names to works-in-progress. According to Michael Krogsgaard in an article in the Dylan fanzine The Telegraph, the song was at some point named Lunatic Princess. It is possible that Dylan simply substituted one crazy name for another and it really has no other meaning. ¶ 8 Leave a comment on paragraph 8 0 A more interesting possibility is that Dylan is pointing out the debt this song has to old blues songs. 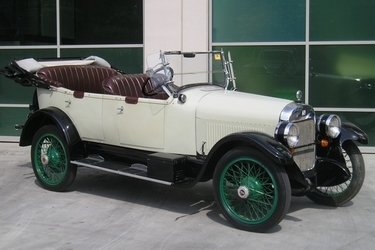 According to Andrew Montgomery in his book On the Road: American’s Legendary Highways, the Buick car company produced a model called the “Buick 6” from 1914 to 1930. Given that many of the old blues songs that Dylan has mined so well were being written during that time frame, it is not beyond the realm that Dylan wanted the title of the song to bring to mind that time period. ¶ 9 Leave a comment on paragraph 9 2 Most commentators – including Paul Williams and Robert Shelton – interpret the lyrics of the song as a tribute to a woman, an “Earth Mother” type who takes care of her man, putting a “blanket on his bed”. I don’t see it quite that way. It seems to me that there are two distinct women in this song: his “graveyard” woman who keeps his kids (i.e. his wife), and his “soulful mama”, a mistress who knows what he wants (i.e. his mistress). ¶ 11 Leave a comment on paragraph 11 0 The key word is “but”, which clearly tells the listener that the narrator is singing about two distinct women. To me anyway, Buick 6 is clearly a cheating song, similar to Stuck Inside of Mobile with the Memphis Blues Again in which his mistress says “debutante knows what you need/ but I know what you want”. ¶ 14 Leave a comment on paragraph 14 0 There are so many lifeless people around the narrator that it will take heavy equipment to remove them, and there’s so much confusion in his mind he needs a big truck to carry his mental anxieties away. Both funny and profound at the same time. What a wonderful way to describe a troubled mind! ¶ 15 Leave a comment on paragraph 15 0 Dylan played From a Buick 6 a few times during a tour just after his electric debut at Newport. Never played again. An alternative version with an extended harmonica intro was released on the Japanese version of Highway 61. I could not disagree more with the reference to From a Buick 6 as a filler. It fits perfectly. Yes, it is a standard 12 bar blues, but that is exactly the point. Delta blues filtered through Chicago blues viewed through a mid-sixties lens on an album named for the road that took the blues from the delta to Chicago. The rawness of the take captures that Muddy Waters transition from acoustic to overblown distressed amp electric blues. If you never saw Dylan at Newport when he switched, he was doing the same thing. I would say this song captures more of what the album is about than most songs. Paragraph 8 hints to the answer, but really how much more transparent does Dylan have to be? This is a song about what the bluesman experiences as his view from the Buick 6 much like Robert Johnson. Think from Memphis to Norfolk is a 36 hour drive – time to reflect. I think you could write a dissertation on Dylan’s use of the word “mama”. In this case, my first instinct was to think he is contrasting his wife/lover with his fearsomely loyal mother, who will do anything for him – keep him fed with bread, sew him up with thread (metaphysically speaking, naturally), and even continue to make up his bed after he dies, but who can’t save him from death itself or even existential despair. As in “It’s Alright, Ma”, the mother is the figure that Dylan’s narrators call out to when they are on the edge of despair or death (also see: “Mama take this badge off of me”). Still a great depiction of a fearsomely loyal woman.